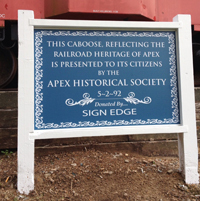 Welcome to the Apex Historical Society website. Take a tour around the site and learn about the history of a small town once called "Log Pond" and later named Apex and how it has grown from a small rural village to a bustling urban community of over 50,000 and growing! Discover the excitement of living in a thriving North Carolina community rich in history, shaped by its small town character and offering the best in residential living within a short distance of the Blue Ridge Mountains, the Atlantic Ocean and major metropolitan destinations. The Apex Historical Society is a non-profit, membership-supported organization dedicated to preserving, protecting and promoting the history of Apex, North Carolina. 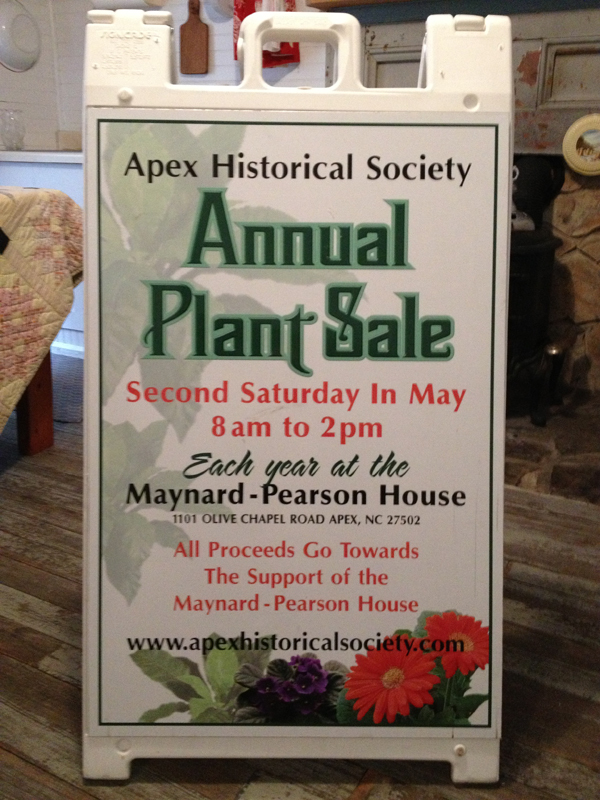 The Apex Historical Society annual spring plant sale will be held May 11, 2019, at the Maynard-Pearson House, 1101 Olive Chapel Road, Apex, NC 27502. The annual AHS Plant Sale will offer a large selection of plants at low prices for those that love gardening. Please contact Diane Long (919-418-6625) for additional information or to donate plants for the sale. All proceeds go toward maintenance and operation of the Maynard-Pearson House. Mark your calendar to attend free historical presentations at the Halle Cultural Arts Center. See our full calendar for all events. These are FREE events provided by the Apex Historical Society and open to the public! Check back for news of additional presentations! This was our part of the annual three day Apex community holiday event each December. Please contact us if you would like to be part of the team planning the 2019 tour and decorating the Maynard-Pearson House. This will be the our 33rd time hosting the event! Click for information about homes that were on the AHS 2018 Home Tour. The Society often has opportunities to serve on both the AHS Board and the Maynard-Pearson House Trust to help with preservation of local history and to plan social and lecture activities for the local community. The MPH Trust owns the property and handles maintenance and upkeep and the Board plans events and conducts tours of the House and offers presentations to community and school groups about local history. Please contact us if you would like to join either of these groups and help continue these activities! The AHS is seeking donations to help with costs to repair siding, porches, windows and painting the entire exterior of the Maynard-Pearson House on Olive Chapel Road. The cost was $16,500 and was done in September, 2017. We are seeking funds to offset the cost and continue maintenance of the house and grounds. Please make a donation via PayPal and you will receive a confirmation by email to use for tax purposes. The AHS is a 501-c3 charitable non-profit organization and all donations are tax deductible. If you are in need of charitable donations this is your big opportunity to help restore the 1870 structure to its glory! 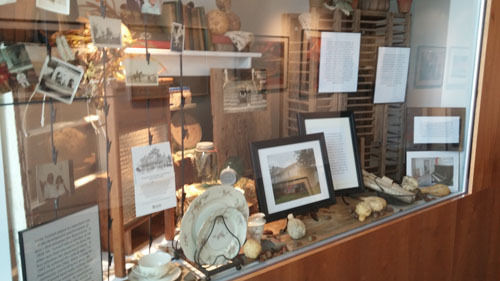 Discover more about the history of Apex by heading to Historic Downtown Apex and drop by to see the AHS Halle Window display at the back end of the hallway. Thanks to Heather Werking for a great new exhibit! Tours of the AHS Maynard-Pearson House on Olive Chapel Road are available for school groups, community organizations, visitors and anyone interested in seeing a home representing life in the late 1800's. Tours are FREE and take about an hour. Donations are always welcomed if you wish to help with maintenance of the home. Send us an email note If you want to arrange a personal tour to learn about history of the house. AHS Newsletters are available on the website. Click to read the latest dispatch or see all newsletters. Check out the Holleman brothers local book about history of Apex from when the town was established through 1941. The publication is available at The Rusty Bucket on Salem Street in Historic Downtown Apex. The Society is continuing a long term project to capture and preserve an "oral history" and memories of the area as told by many residents born or living here in years past. Over 85 interviews have been recorded and more are scheduled. Read the project plan and consider joining the team in this ambitious project. Team members may click here to view and print Oral History interview forms as needed. Click to view a slide show typical of our annual home tours and the Maynard-Pearson House "open house" events. The virtual tour provides a glimpse of historical Christmas decorations typical of the late 1800's and reveals some the town's history. The slide show was prepared by Mack Thorpe, member of the Society and co-owner of The Rusty Bucket, one of the local shops supporting the Society. Our sponsors and contributors help us maintain the Maynard-Pearson House and downtown Caboose and continue to offer tours and events for the community. We recommend these local businesses and use them when we need painting, repairs and other services. View their websites and "buy local" to support the community! See our full AHS calendar for events throughout the year. Check back soon for news of upcoming events!